If you’ve had your laptop for a few years, you’ve probably noticed it starting to slow down. Maybe your operating system doesn’t start quite as quickly as it used to, or there’s a noticeable lag before your favourite programs open. If so, you could be due an upgrade – and now is the perfect time. Portable technology is racing ahead, and next-generation laptops are so thin and light you can comfortably carry them all day. They’re also amazingly powerful, capable of handling even the most demanding desktop software with ease, and can run for well over 10 hours on a single charge. If you’re struggling with a sluggish laptop, the difference will be like night and day. Whatever you use your laptop for, there’s a Microsoft Surface that’s perfect for you. Each one is made to Microsoft’s exacting standards so you know you’re getting great quality and the best possible Windows experience. If you’re a regular traveller, take a look at the super portable new Microsoft Surface Pro 6. It’s amazingly thin and light (just slip it into your bag or briefcase and you’ll barely know it’s there), and its battery will last up to 13.5 hours without a top-up. Whether you’re on a train or plane, in a lecture or at a conference, you can keep working all day without hunting for a power outlet. Need something more compact? The brand-new Microsoft Surface Go packs all the style of the Surface Pro into a smaller package, and can be used as either a tablet or a laptop when purchased together with the optional Type Cover. It’s perfect for watching films and presenting on the move, with a solid nine hours of battery life. Its Full HD 10-inch screen is bright and clear, and you can keep working or playing for up to nine hours before recharging. The Microsoft Surface Go is also surprisingly affordable, proving that power and great looks don’t have to cost a premium. For sheer speed, the Microsoft Surface Laptop 2 is hard to beat. Not only does it look amazing with its clean lines, it’s equipped with an Intel® Core™ i7 processor and 8GB RAM to make light work of multi-tasking. Thanks to its 256GB SSD, Windows 10 boots in the blink of an eye, and you’ll never be kept waiting for programs to load. The next generation Microsoft Surface Laptop can run for 14.5 hours away from the mains – an amazing feat for such a powerful device. 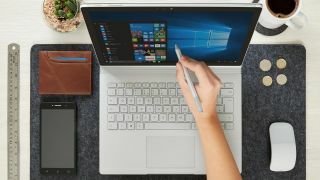 The Microsoft Surface Book 2 strikes a perfect balance of power and convenience that makes it ideal for creatives on the move. It offers fantastic performance (particularly in the visual department thanks to its dedicated graphics card), and switches between tablet and laptop modes in the blink of an eye. Whichever you choose, Windows 10 adapts automatically to give you the best possible experience. With an amazing 17 hours of battery life, it’ll keep going as long as you do. A new laptop is a major investment, so you want to be sure you’re buying from a retailer that cares, and will make sure you get the best experience possible from start to finish. AO has earned a Trustpilot reputation of 9.2 from over 100,000 reviews thanks to its professional, friendly service. When you buy from AO, you can rest assured you’re getting a great deal – and with its price match promise, if you can find the same laptop cheaper somewhere else, AO will refund you the difference. You can’t say fairer than that! There’s even £250 cashback available on selected laptops to make the offer even more tempting. AO offers next-day delivery seven days a week, so you won’t have to wait to start enjoying your new laptop, and standard delivery is free throughout mainland UK. You’ll receive a text message on delivery day giving you a one-hour delivery window, so you can go about your day rather than waiting around for a knock at the door. To find out more, visit AO.com and see which Microsoft Surface laptop suits you.